Never throw away stale bread again! In this week's episode of Mad Genius Tips F&W's Justin Chapple shares an amazing secret for reviving floppy loaves. Here, 5 recipes to make with your newly fresh bread. Tory Miller's variation on the classic bagels with lox and cream cheese uses smoked trout and is fantastic on toasted baguette. 2. 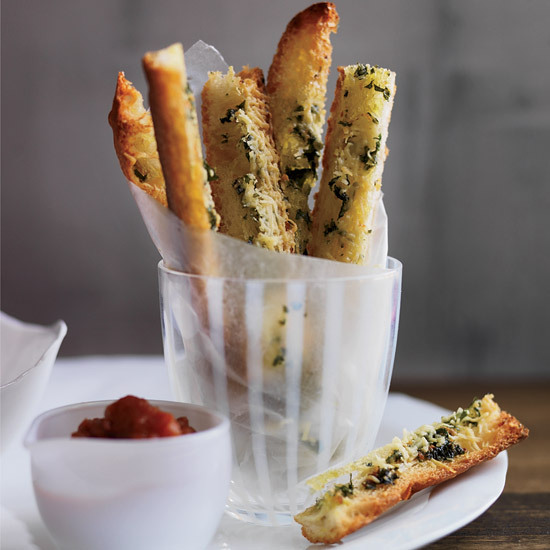 Garlic Bread "Fries" with Marinara "Ketchup"
Garlicky bread sticks and marinara sauce are a great party snack. Leftover bread + leftover cheese = Jacques Pépin's delicious melted toasts. These spicy sandwiches resemble a Vietnamese banh mi. Barbara Lynch's incredible fondue features croutons flavored with caraway butter.